No mini-map? 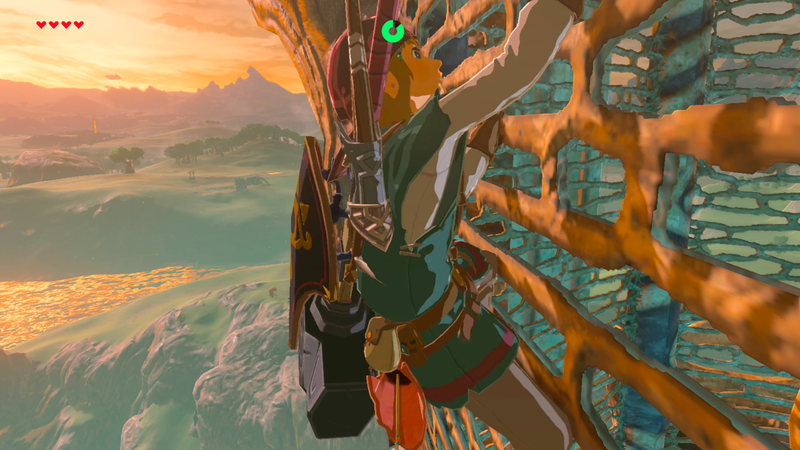 Just health hearts and a stamina gauge when The Legend of Zelda: Breath of the Wild is set to the “pro” heads-up display option. My emotional journey over my first four hours of playing the new Zelda: liked it, grew skeptical of it, doubted it, regained appreciation, now hooked on it. If you love the Zelda formula you may take this same ride when you start playing The Legend of Zelda Breath of the Wild, which comes out for Wii U and Nintendo Switch next week. I’ve only played a paltry bit of this gargantuan game, so I cannot tell you how that journey may end. I liked it when I sampled it on the Wii U under time pressure last June at E3 and was quickly pleased again when I booted it on my Switch a few days ago. It is a game of immediate action. You wake in a cave as Link, asleep for 100 years and amnesiac. You grab some clothes, go outside and have an axe in your hand in about three minutes. You can talk to an old man and receive a basic quest, but you can also wander off into a forest, venture toward a camp of enemy creatures, dive into a lake or dash through a field. You are given sudden freedom to do what you will, a liberty unmatched by any Zelda since perhaps the first one. More stats in a Zelda game since that second on on the NES that no one talks much about. If you, like me, are a fan of many recent Zeldas, you expect an authored experience, something that feels laid out by a designer’s hand. Zelda games are the opposite of all of gaming’s randomly generated content. Their landscapes are intentional, their pathways paved purposefully. We play Zeldas with some freedom but mostly with the assumption that the games’ designers have crafted us interesting, specific things that all of us playing the game to completion will do. Breath of the Wild swiftly feels that it is not that, that it cannot be that. Even in its opening area, a vast central plateau, it feels too open to be crafted, too unfenced to ensure common experience. In those opening hours, my worry grew as it began to feel too random to feel like Zelda. The game quickly came to resemble a chemistry set, a simulation that would deliver experienced not by hand but by algorithm and math. This is not an insult. It’s what brings people pleasure when they poke at games as diverse as The Sims, GTA III and Civilization V. In Breath of the Wild, different weather systems would roll in. I had to eye a temperature gauge, lest Link freeze. I started noticing lots of stats. Weapons have numbered strength and can break. A pop-up message informed me that apples could generate X hearts when eaten uncooked and more when cooked. Picking up mushrooms and meat prompted new messages about recipes and adjustments to my stamina or stealth stats. What is this game? A tiny part of the game’s map at maximum zoom. X marks where I previously died. The game auto-saves often and revives you near where you croaked. My skepticism and doubt increased as I explored the first of the game’s Shrines. The Shrines are mini dungeons. There are supposed to be hundred or so of them in Breath of the Wild and even now I’ve only done six or seven. By the time I’d done the first few on the plateau, I’d come to think of them as the equivalent of a room or two of a classic Zelda dungeon. They are smartly laid out and quickly teach you some of Link’s new abilities such as wielding a big magnet to solve physics puzzles, but they felt small, like an acknowledgement of my taste for hand-crafted Zelda, a diversion from the more untamed world above. I feared it wasn’t enough. To get from one Shrine to another in the introductory plateau, the player can climb a cliff or walk through a valley. There are multiple approaches. To get to the fourth, I needed Link to trek through a snowy area that made him shiver and shed heart-metered health. I first approached the snow area via a cliff, learning the limits of the game’s new stamina gauge, which would leave Link dropping to his death if it expired before he found a foothold. Once up there, I found an encampment of enemies, fought them and then tried to stand by a fire to keep warm. Soon I was back out in the cold and I eventually froze. My colleague Kirk fared better, telling me he was able to go from fire to fire, lighting some on his own and brute-forcing his way to the fourth shrine. My colleague Jason did something different. He figured out that cooking spicy peppers that were growing near one entrance to the snowy area could generate a meal that would keep Link warm long enough to survive the cold. I found a note from an old man that indicated I could find warmer clothes somewhere, but I didn’t find them. I backed up and approached the snowy area from another angle and spotted a raft with a sail. The raft was at the end of a bridge, but the bridge was out. I saw a tree nearby and grabbed my axe. You can figure out the rest. My doubt faded. My sense that this world was as random as it initially appeared melted. There was a designer’s hand all over this place, just more subtly. I finished the game’s intro plateau quests and glided out to its bigger, wider world. I had a quest marker far, far away and a road before me. On the road I found a cave with a little puzzle inside it. I found more enemy encampments and began to recognize them as combat puzzles of their own: how to take out the sentries? Do I shoot the exploding barrels or use those metal crates nearby to win the fight? Can I kill these enemies before they rush over to their weapons to attack me? I took the game with me to work and shared it with more colleagues. Bold Patricia got off the road and ran toward the center of the map, eager to see if she could beat the game, as teased, straight away. She got chased by massive enemies. One booted her/Link ahead. “Speedrunning strat!” she exclaimed, but soon another enemy appeared and killed Link. You actually die a lot in this game, since you can often go where you’re not supposed to go. Of course you should climb it. Of course it’s a subtle part of a puzzle you don’t even realize you’re beginning to solve as you go up the ladder. Poke at this game world and you shall be rewarded—so far! I’ve gotten back on the road then wandered off it. Little things keep catching my eye, and when I approach a suspicious hut or a curious chain or an odd ridge, I’m usually rewarded with a puzzle of sorts. This wild world has definitely been hand-shaped. The game is beautiful and quiet. You hear the wind and the animals. Music rarely plays. It’s subtle, not shouting that it is a bona fide Zelda game packed with a heap of authored wonder, but instead letting you learn that for yourself. At least early on, that’s how it is going. It’s hooking me. And I’ve just made it to the first town, so eager to play on.